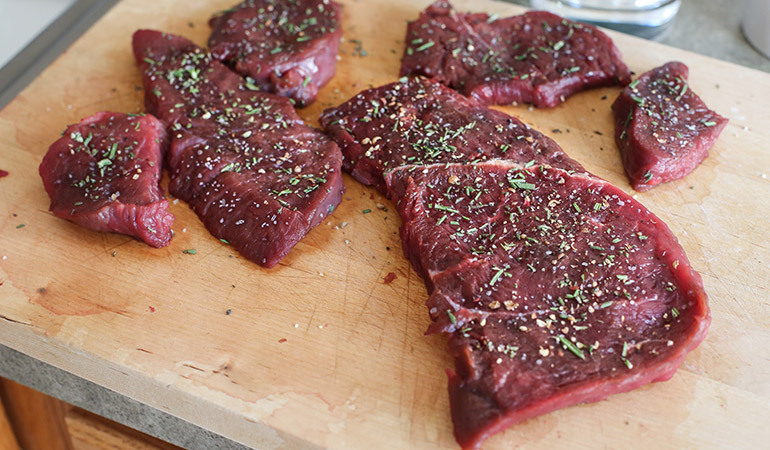 Take elk venison steaks out of the refrigerator at least 1 hour prior to cooking (I prefer 2 hours). This will allow steaks to come to room temperature, ensuring more even cooking. Remove as much silver skin as possible. Pat steaks dry with paper towels and sprinkle with chopped rosemary. Set aside. Meanwhile, scrub russet potatoes under running water to remove all dirt. Cut potatoes into shoestring-sized pieces, dropping fries into a bowl of water as you go along. This will keep the potatoes from becoming brown. The water will also help remove excess starch from the potatoes, which can cause clumping and also inhibit the fries from getting crispy. Some people soak the potatoes overnight, but I didn’t have time for that. For the perfect crispy-outside, tender-inside French fries, you will have to double fry your potatoes. 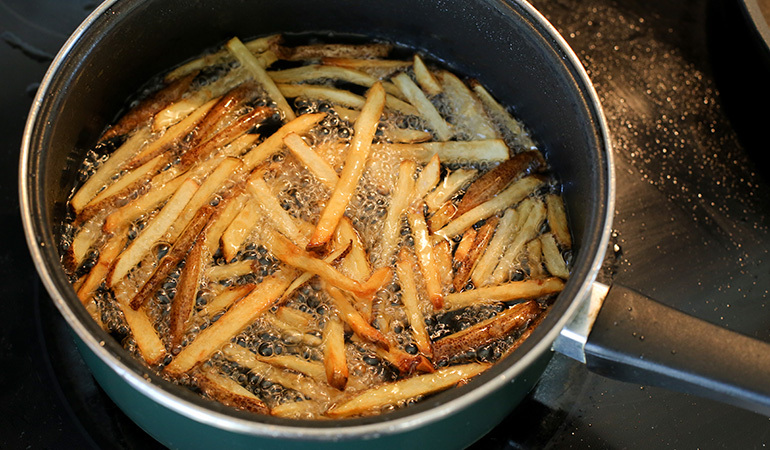 The first fry at a low temperature ensures that the fries will be cooked through and fluffy on the inside, while the second fry will give them crunch. For the first fry, heat enough oil for deep-frying to 300 degrees Fahrenheit. Depending on how big your cooking vessel will be, you will probably have to fry your fries in batches. 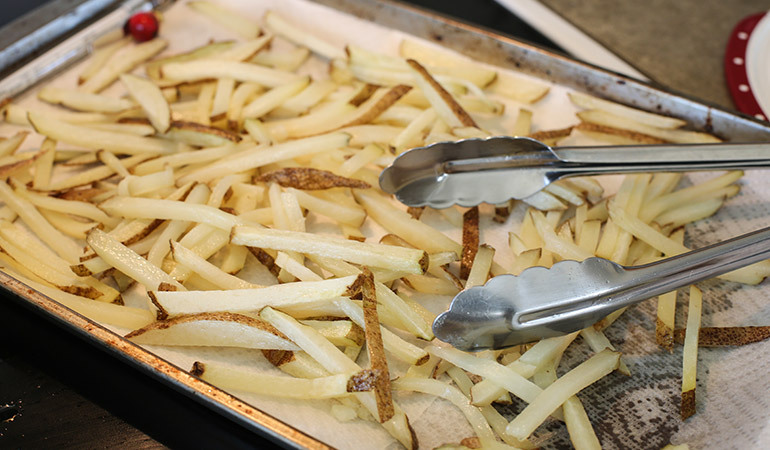 Take a handful of fries out of the water and dry them as well as you can with paper towels to avoid splattering. Carefully drop them into the 300-degree oil and fry until just tender, about 3-5 minutes. Gently stir French fries in the oil to avoid sticking. 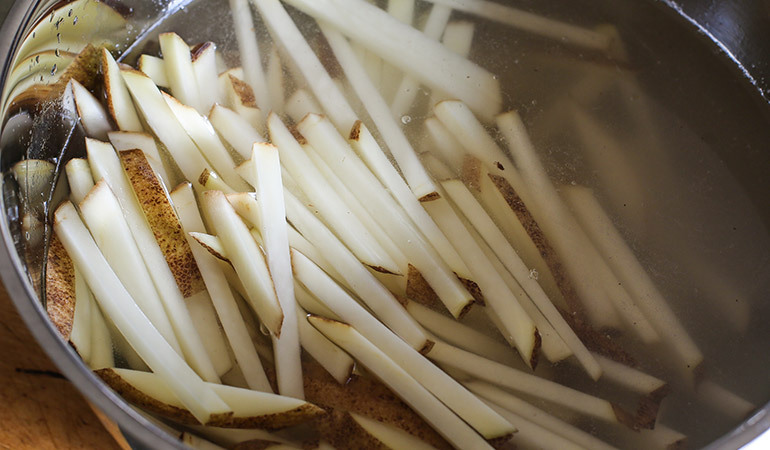 Fries will not look brown at all at this point; you’re essentially just blanching them. Drain on paper towels and repeat with the rest of the fries. Set aside until you’re ready for the second fry. For the second fry, heat oil to 375 to 400 degrees. Fry French fries again in batches until golden brown and crispy. Toss with fine salt to taste. Meanwhile, over medium-high, heat enough oil to coat the bottom of a skillet. Dab elk steaks dry with paper towels and sprinkle kosher salt and coarse ground pepper all over. Cook for about 2-3 minutes on each side for medium-rare. Cooking times will vary depending on steak thickness. Serve steak with fries and a light, tangy salad. 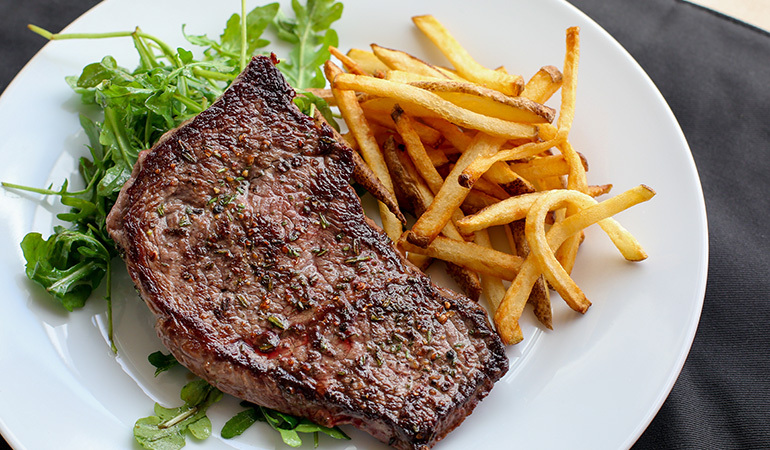 Classic steak-frites can be found in almost any American steakhouse or European brasserie. Here, I show you how to make homemade French fries, soft on the inside but golden and crispy on the outside to accompany your hard-won elk venison steak. Though an uncomplicated dish with few ingredients, steak-frites, when made well, sets the bar at any table with its simplicity and elegance. For some freshness and greenery, I suggest the pepperiness of arugula (rocket) with tangy balsamic vinaigrette that balances well with the elk and fries. I prefer a dry, dark red wine with this dish, such as cabernet sauvignon, zinfandel, syrah, shiraz, petite sirah, Bordeaux or a darker red blend.